I have told my husband I will go with him anywhere … except the Amazon jungle. Our vacation in Belize has confirmed to me that this is a good decision on my part! Here is some vocabulary that I use to talk about fishing in the swamps there. Should you wade in the swamp? We recently traveled to Belize. Specifically, we went to a very small island called Ambergris Cay. It has beautiful ocean on both sides of it. However, in the middle of the little island there are huge swamps. And, yes, crocodiles live in those swamps. My husband and his friend spent much time fishing there. They caught a few fish that put up a good fight. They threw the fish (that they had caught) back into the swamp. They waded into the mud, but fortunately no crocodiles caught them by the leg. It is not always easy to see the crocodiles in the swamp. In some places the water is very shallow. We saw crocodile slides⓬ as we drove by. There are also many birds in the swamp, probably also trying to catch fish to eat. Maybe the crocodiles eat the birds. Hopefully, after this trip my husband has seen enough crocodiles to keep him happy now. ❶ This is just a sound word and can also be written as 伯里茲. Only the middle character is different and the only difference in how it is said is that it is a 3rd tone instead of a 4th tone. ❷ This is not a well known country and my tutor said the English name would actually help clarify it even for many Chinese speakers. ❸ This is such an obscure name that it wasn’t worth translating into characters. ❹ When I have answered something correctly, my tutor frequently says 沒錯 “not wrong.” That is the same sense used it. It is setting up the following statement as something you can be sure of. 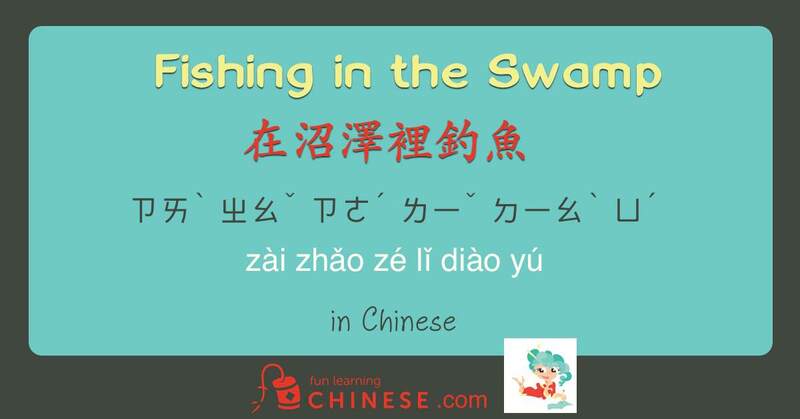 ❺ When I first wrote the sentences, I used the word 泥沼 ㄋㄧˊ ㄓㄠˇ (ní zhǎo), but my tutor says that indicates more of a muddy area, whereas 沼澤 gives the picture of more water, thus it could be translated swamp, marsh, or wetlands. ❼ This is a case of understanding that even though 魚 by itself would be a noun, when it is combined with 釣 the two together 釣魚 are a verb. ❽ There is an important difference of implication between 才ㄘㄞˊ and 就 ㄐㄧㄡˋ. Here are 3 sources that clarify it nicely. The first one is a 15 minute video, so also is good listening practice. Be aware that they all use simplified characters. In my sentence, 才 is used to indicate that “finally after a good fight during fishing” the fish was caught. ❾ I have placed in the second set of brackets  everything that is describing the fish. Figuring out just how much is included in the use of the adjective marker (in this case placed just before 魚) , is important. It does not always include so much of everything in front of it, but in this case in includes everything except the subject of the sentence, 他們, and the verb 釣到. It may also be helpful to note that while the main verb (right after the subject) is a verb of completion, the verb in the brackets describing the fish uses a verb + 起來, because the brave fight was occurring during the act of fishing in progress. ⓫ The second character in this word, 住, is the same one used in the word meaning to reside, or to live someplace. So when added to 咬, it means the teeth stay there and hold on or “reside” in the thing that was bitten. Ewww. ⓬ A crocodile “slide” is the mark crocodiles leave because their body is so low and heavy as to drag through the mud when they move along the bottom of the waterway. ⓭ Using 來吃 after a verb means that action took place so that they could get to eating.